Risk managers at HBOS were discouraged from challenging business decisions, a former employee has told BBC News. Anthony Smith said the risk group's culture changed in 2005 after his boss Paul Moore was replaced by someone with no experience of risk or regulation. "There was definitely a dumbing down of the risk function and challenging the business... was not welcome," he said. The bank said Mr Smith was a "junior employee" and the new director of risk was a "senior banker". How HBOS was run has come under question in recent weeks after Paul Moore, former head of regulatory risk, alleged he was sacked after warning the bank about excessive risk-taking. HBOS denied the allegations and pointed out an inquiry had concluded they were "unfounded", but the publicity led to the resignation of former HBOS chief executive Sir James Crosby as deputy chairman of the City watchdog the Financial Services Authority (FSA). 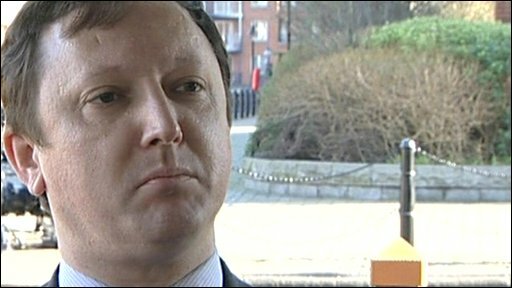 Anthony Smith, who worked for the banking group as a manager until late 2005, told the BBC that Mr Moore's successor as the risk director Jo Dawson knew nothing about risk or regulation, a claim the bank denies. Anthony Smith: "I was told to keep quiet"
Mr Smith, who contacted the BBC News website, described an occasion when Jo Dawson was asked to speak at a dinner attended by FSA chief executive John Tiner and other senior regulators. "She didn't want to look foolish at that meeting, obviously, so I was asked to prepare a four page bullet-point summary of regulation for her," he said. Mr Smith received an e-mail thanking him for the note, saying that Ms Dawson, "found it very easy to understand and didn't need any extra explanations". "I thought it was a little bit strange for somebody in that position, to be on the board advising them about risk who has no knowledge at all about risk and regulation," Mr Smith said. However, a spokesperson for Lloyds Banking Group, which took over HBOS last year, said: "Jo Dawson is a very experienced and senior banker with more than 20 years experience in the industry. She took her role as risk director very seriously indeed." An investigation by KPMG also supported the appointment of the new risk director. The culture in the risk group changed following the departure of Paul Moore, according to Mr Smith, with steps taken to prevent them challenging the way the bank was being run. He said they introduced relationship managers who had to communicate with the rest of the organisation "in a friendly way so as not to upset the business". Mr Smith gave the example of an occasion when he had reported compliance problems after carrying out a review of the advertising of HBOS's financial products. He said he was told that he could not write a report in such a direct fashion. "The problems took about six to 10 months to resolve. When really we could have sorted them out straight away." "We were constantly being pushed back and constantly being told that things had to be put in a way that wasn't going to upset the business - basically that wasn't going to stand in the way of the sales culture at the time." Mr Smith took redundancy from HBOS a year later, in 2005, when his employers wanted him to move to Halifax. He had worked for parts of the banking group for six years. 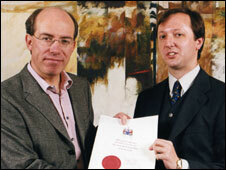 The chief executive of HBOS at the time was Sir James Crosby. Last week, he resigned from his job as deputy chairman of the FSA, although he denied that he had forced Paul Moore out of HBOS for challenging its approach to risk. In the light of Mr Moore's allegations, which were aired by MPs on the Treasury Committee, the FSA said it had carried out a series of risk assessments of HBOS dating back to 2002. The FSA also pointed out that it backed the findings of an inquiry into Mr Moore's allegations which had concluded his concerns were unfounded. The discussion of the risks taken by HBOS has been particularly pertinent since Friday last week, when Lloyds Banking Group, which now owns HBOS, announced that its acquisition would be announcing full year losses of about £10bn.